MadgeTech is excited to be traveling to St. Cloud, Minnesota this week for the annual Minnesota Association of Meat Processors (MAMP) Convention. The convention, which runs from March 4th through the 5th, brings businesses together to learn about the latest technological developments and regulatory compliance solutions for the meat processing industry. This year, MadgeTech's HACCP certified sales representative, Matt Rivero, will be demonstrating the RFOT Wireless Meat Temperature Data Logger. This product is an industry favorite with meat processors all over the country. Some advantages of the RFOT include the rugged design, specifically engineered to withstand the harsh environments of smokehouses. The wireless functionality allows users to receive immediate text or email alerts if desired temperature thresholds are not maintained and provides real-time data that can be accessed remotely with the MadgeTech Cloud. Best of all, the RFOT delivers the flexibility to monitor multiple processing steps, from cooking, to cooling, storing and freezing, all with one device. On Saturday March 5th, MadgeTech, in conjunction with Gohmann Supply LLC, will be presenting an introduction to data logging and how it plays a role in solving compliance challenges for meat processing professionals. This will take place at 1:10 PM at the Terry Haws B Seminar Area. Please join us for this presentation or stop by the MadgeTech booth! 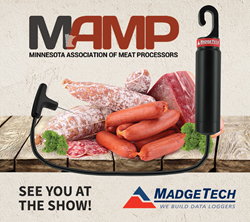 For more information on MadgeTech's series of meat data loggers and to learn more about the MAMP Convention, contact MadgeTech at http://www.madgetech.com/contact-us.